I am Lang. I set up an inclined TOUGH2 flow model using Petrasim. I was wondering if the direction of the peameability is horizontal (along the x-z axis) or parallel to the layer that I set (as the figure shows). Thank you! The answer to this question really depend on whether you've made this an inclined model by using the layer editor to control the elevation of the cell tops and bases, or whether you have modified the angle of the gravity vector. 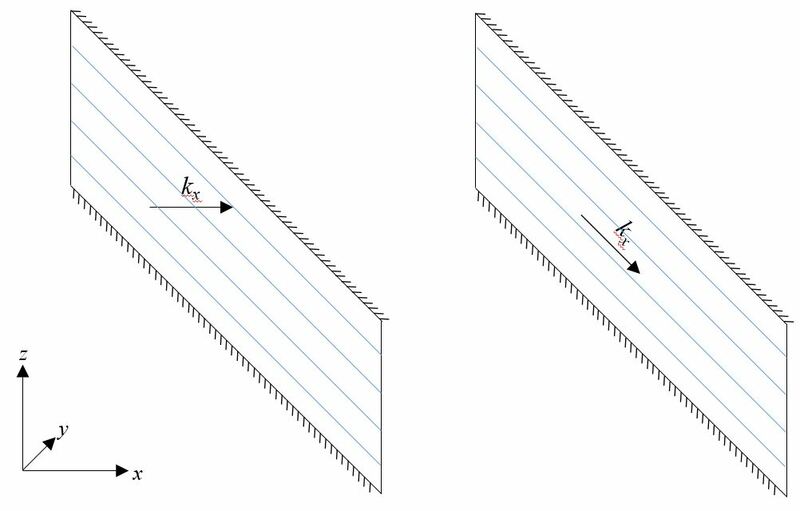 If you've modified the gravity vector, then cells have essentially been rotated with respect to the gravity vector and kx would be like the second image. If you've modified the cell elevations, then the x and y connections are still perpendicular to the gravity vector and the kx and ky connections are vertical. Keep in mind that if you take this approach you are introducing a small amount of error into the model since the top and base cell connections are no longer horizontal. Dear Alison, Thank you so much for your answer. It is very helpful for my current TOUGH2 model.